The release of six-month-old, record-breaking greenhouse gas figures late last Friday was met with cynicism, outrage, and a solid shot at spin over the weekend. More importantly, it caps off four consecutive years of emission increases and exposes any pretense that Australia will meet its climate obligations. In the lead-up to the weekend’s AFL and NRL grand finals, and coinciding with the banking royal commission’s interim report, the Department of Environment and Energy released a quarterly emissions report demonstrating a 1.3% annual increase to March 2018. For critics, the timing is suspicious. Just last week, the Climate Council were calling out the government’s six-month delay and, pointing to other releases timed around Christmas Eve, acting CEO Dr Martin Rice painted Friday’s report as a “cynical attempt to avoid scrutiny”. But timing aside, the fact is Australia increased its total output by 6.8 million tonnes of carbon dioxide equivalent (Mt CO2-e) from March 2017 to 2018. It’s Australia’s 15th quarter of consecutive increased annual emissions and, excluding unreliable land use data, proof of Australia’s highest recorded level of carbon output at 536.7 Mt CO2-e.
At a time when places like the UK are down to 1890s levels, this result raises questions about how long Australia can go without a carbon price. Though this was implemented for just two years (2012-14), we know it helped decrease total emissions (1.4% in that final, second full year). Our latest annual jump can mostly be attributed to Australia’s expansion in gas exports and production, which pushed our fourth largest sector (fugitive emissions) up by 13.7%. Australia also saw by a 2.1% increase in our second largest polluter (transport) and a 4.1% jump in our third (stationary energy excluding electricity, i.e. heating). This was all offset by a 4.3% decline in Australia’s largest polluter, electricity emissions, and thanks largely to reduced demand, Hazelwood’s 2017 closure, and the growth of renewable energy. For more on that point, Prime Minister Scott Morrison told Insiders on Sunday that Australia has “hit the threshold point, where the investments make sense, increasingly, without subsidies”. Morrison, it needs to be said, does a strong job emphasising the 28-year-per-capita low, and is correct in putting much of this electricity progress down to the 2020 Renewable Energy Target, CEFC and sheer economics. But it’s more difficult to claim credit for it. Add in state and territory action (including South Australia’s new Liberal government), and we have four success stories the federal government either had nothing to do with, tried to kill, actively undermined, or just announced they will let die in 2020. 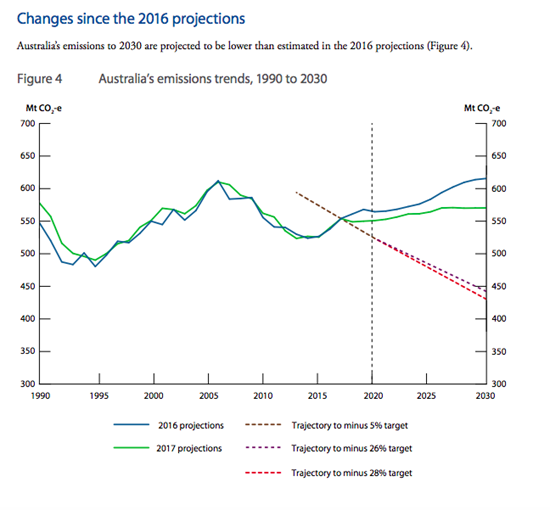 There’s also Morrison’s assurance that, with a climate policy vacuum and plan to end the RET, Australia will meet its 2030 Paris target of a 26% reduction on 2005 levels at “a canter”, and admission that “none of us are Nostradamus in this”. Crikey has sought clarification on the former point, but has not received comment before deadline. Both of these statements fly in the face of work done by the Australia Institute, NDEVR Environmental, ClimateWorks Australia, the United Nations, and the Australian government, with the Department of Environment and Energy projecting last year that, under current policies, our 2021-2030 emissions reduction task will be missed by 868-934 MtCO₂e. The Climate Council’s Martin Rice tells Crikey that even Australia’s 26% commitment is “woefully inadequate and is not aligned with what science says is necessary to effectively tackle climate change”. Does that stack up? A recent Frontier Economics report found Australian households will experience savings leading to 2030 where policy remains business as usual or moves to 26%, 45%, and 65% targets, with “45%” exceeding “business as usual” prices by roughly 0.02%. What do you think of the government’s handling of this issue? Get in touch at [email protected]. As a predictor of electricity prices Morrison lacks any credibility. He has been a minister in Coalition governments under which the price of power has ballooned. And hasn’t his ascendency to Prime Minister also killed off the NEG which was supposed to save peasant households hundreds of dollars per year? That aside, we continue to revel in the alleged $550 annual windfall which Abbott promised in axing the carbon tax. Funnily enough, $550 was o be the NEG saving too! “Mozzy” was on Insiders yesterday, telling us how “we” are going to meet “our” emissions reduction targets in a “cantor”? ….. Eddie died 54 years ago, come Wednesday week? ….. He was also telling us about “how we don’t change birthdays” (when it comes to his team Australia Day) when Australia was “born” on January 01 1901 : if anything it was “conception” that occured on Jan 26 1788? New South Wales was “born” on 26th Jan 1788 if anything was. Perhaps the States that were at that time wholly or partially within the imaginary borders of NSW could be included. That still leaves the inclusion of all Indigenous Australians and everyone in the western third of the continent, never part of the NSW colony, in a celebration of someone else’s “birthday” without any good reason. If anything proves that Indigenous Australians have nothing to do with a colonial celebration it’s the fact that until well into the second half of the twentieth century Indigenous Australians were not Australians. They were not counted in the Census and if they wanted to become citizens they had to apply and be approved. Even if they served in the Armed Forces they were not entitled to the benefits given to non Indigenous service personnel on their discharge. Oz emissions of 536.7 Mt/a amounts to 22.2 tonnes per person per annum. The Brits emit 10 t/p/a. Carbon taxes are ineffective unless consumers of energy get to choose the power of lower cost. We should be able to choose the source when we pay our bill. yesterday’s “Insiders” should be compulsory viewing for anyone who wants to know about Morrison. He was just appalling. He accused Cassidy of editorialising, went on to do some truly creative editorialising himself, lied about Emma Alberici’s report, then wound up with a personal threat to the ABC. Very classy. He lied about meeting the (woeful) 26% reduction target and has publicly removed pretty much all policy regarding emissions reduction from the government’s agenda. That’s how this government handles the issues raised in this article. Maybe he thinks his god will sort it all out? He certainly has no ability himself. Was he lying before or after he got down on his knees to the sky fairies? Not that it matters, it’s amazing that he considers himself to be staunchly religious, but has more in common with Judas Escariot than any of the other characters. Oh, and I loved Cassidy’s comment that the ABC people didn’t stop working. ……”we still have the Clean Energy Finance Corporation”. No thanks to this mob. They wanted to scrap it almost as soon as they took office, only the senate prevented them from doing so. ……”and we still have the Emissions Reduction Fund”. Oh, is that the supremely dodgy “Direct Action” policy set up by Abbort? Sheesh, if that’s the best this mob can do, then its no wonder they’re so far behind in the polls. Journalists should hand him a lump of coal to hold on to during every television interview. A 1.3% annual increase is not all that much. While Australians are large per capita contributors to C02 composition in the atmosphere the total amount (multiplied by the population) is marginal. Little, if anything, is achieved by banging on about Australia’s emissions in total. Given that the increase in global emission for 2017 is 426.4 million tons then Australia’s contribution at 6.8 (same units, as reported) is about 2% (1.6%); yeah; we would notice that amount of increase! “The Climate Council’s Martin Rice tells Crikey that even Australia’s 26% commitment is “woefully inadequate and is not aligned with what science says is necessary to effectively tackle climate change”. is just stupid. What is intended by the word ‘effectively’ or ‘woefully’ or the phrase ‘science says’ or was it intended as “simon says”. Developments in Solar energy by South Korea are impressive to say the least. Contemporary designed nuclear reactors are feasible for the country. However, for a government that cannot convene a COAG meeting such a government is unlikely to have an informed energy policy. Two significant factors effecting declining emissions in the UK and USA are a diminished requirement for energy (circa 2%) and, somewhat related, warmer winters in conjunction with a diminished use of coal. Now, let’s get real (which the author of the article could have done). For the year 2017, the USA as undergone a decline in C02 emissions of about 40 million tons followed by the Ukraine (20m tons)and Mexico (18m tons) to the UK of about 12 million tons. Woopy-doo. Then we have countries that have increased their emissions such as the EU, Turkey, India and China of 42, 42, 90 and 120 million tons respectively). Those four countries contribute about 70% of total increased emissions. Then there are South Korea, Russia, Canada and Spain with increases of about 16m tons each. Let’s not forget Indonesia and Iran which sit in between Spain and Turkey. It is a pity that Morrison is so damned ignorant of a basic topic such as this because the Libs, to a large extent, are justified in doing nothing OTHER than to formulate an energy policy for (e.g.) 2035. It is also a pity that the article was not of a much higher standard. P.42 of the Sep/2018 issue of Quadrant contains the following observation. major determinant of global temperature and climate. Discuss the assertion by the author. Marks will not be awarded for pointing out the the last previous interglacial was not 120,000 years ago or that the author is a clown (which he is – and a major player at the Oz Bureau of Met. In general, via jobs in aviation etc., I have the highest regard for these guys at the Met.). So … not the least bit interested in seeing Australia play a leadership role in this? I’ve read your work before, and I would seriously hope your comments don’t get “embargoed”. But don’t set homework. That’s just silly. Two considerations here Lee. First, if there is to be a “leadership role” then it must be informed. I presume that you can recall the idiocy of Rudd charging off to Copenhagen without a clue in the world concerning this rather complex topic. For my money his behaviour embarrassed – well me, at least – and I wasn’t sorry to see him flicked in June/2010; although the replacement was little better. Secondly, unless one can argue against the Bolts and Jones’ of this world not a lot is going to happen – hence the ‘homework’ which, I think, most would see the point of the exercise. Hint on Wednesday nevertheless. Then, as pointed out above, a handful of countries are taking the matter in the opposite direction. Prior to 2013, we had a mechanism that was reducing our CO2 emissions whilst simultaneously putting “money in the bank” (approximately $9bn p.a). We now have a system that is *costing* us money, whilst doing nothing to reduce emissions, & yet has had zero impact on energy prices (as that would require regulation of the energy retail market-something this mob are dead set opposed to). The rise in emissions would have been higher still if this mob had gotten all their own way on such matters as the RET & CEFC (which they wanted to scrap). As for your claims of othrr nations increasing their emissions, I say “put up or shut up”. I have searched everywhere for your figures, but have found they do not appear to exist. The figures I have seen is that China & India have managed to level off their annual emissions over the last few years, the EU-28 continues its downward trend in annual emissions-albeit at a slower rate than the early 2000’s, & Spain is still well below the emissions target it promised to achieve back at Kyoto. As to that idiotic Quadrant article. The role of CO2 in “trapping” the Infrared portion of the EM spectrum has been well established by the scientific community over the last 150 years, as has its major role in maintaining global temperatures at approximately 33 degrees above “black body” temperatures. Trying to talk about what role CO2 played in pre industrial climate change is a moot point, as pre industrial CO2 levels always remained within a 200ppm to 280ppm band. Industrial Era humans, however, began adding ever more quantities of prehistoric CO2 into the atmosphere-CO2 that was sequestered & buried more than 600 million years ago-to the point where levels are now higher than they have been in well over a million years. No surprise then that this has allowed CO2 to achieve a dominant role in driving climate change, to the point that it can now drive temperatures in the opposite direction to what would be expected due to natural factors (incident solar radiation) alone. Not that your mates Bolt, Hadley or Jones would understand or accept even a single word I just said, as their views are driven by ideology & self interest, not science or the well-being of the Australian people. But your two paragraph attempt at the homework (which, it ought to be obvious, I do not endorse [and hence my comments Lee 2 Oct 07:10]) does’t score very highly I’m afraid. In fact if that is the best that you can manage then you have a good deal more research in front of you than you realise. For example your remark “Trying to talk about what role CO2 played in pre industrial climate change is a moot point, as pre industrial CO2 levels always remained within a 200ppm to 280ppm band” is completely incorrect – and it is clear that you have NOT considered any of the references that I have posted on this matter. (as independent) can be expressed for the last 70 million years (which I think you would agree is pre-industrial). portion of the EM spectrum” has only the slightest bearing on what this guy is attempting to infer (CO2 composition has no effect). MY point is that if you cannot address the homework then it is for you to shut up until you can address the homework but I can’t control your desire for self-humiliation on this pages. Your own experience ought to accord with you inclination to “assemble it as you go”. If you are inclined to throw advice about I’m inclined to suggest a career in politics for yourself. I don’t mind questions but, as you can see, I become irritated when I’m told (even by the employees at Crikey) that a ‘ginger cat is green’. ok as promised : a BIG hint : (1) Milankovitch Cycles and (2) Milankovitch Cycles and Glaciation. Comprehensive information on both topics can be found either in Wikipedia or via google or other search engine. There are three variables that change over longish period of time. Our mate at the BOM got confused with Eccentricity and associated effect. He could be a “cash for comment guy” but I wouldn’t know. Eccentricity is the change in the shape of the earth’s orbit around the sun. Currently the earth’s orbit is almost a perfect circle with a 3% variation between perihelion (closest 3 Jan) and aphelion (furthermost 4 July). Over a 100,000 year cycle (strictly a 95,000 year cycle) the earth’s orbit around the sun changes from an ellipse to a circle (and repeats) and thus the earth at the perihelion is considerably warmer when the orbit is significantly elliptical. The Obliquity cycle is a 40,000 (strictly 42,000) year cycle where the axis of inclination varies from 22.1 to 24.5 degrees. The current angle is 23.5 degrees. This angle, when rotation is taken into account, explains the temperature difference between summer and winter. Precession is the change of hemisphere. About 12,000 years from now the Northern hemisphere will experience summer in December and winter in June. In other words, the northern axis will move away from the orientation to the north star or Polaris. The cycle is in the order of 20,000 years. Thus Precession and Eccentricity can constructively (add) interfere and cause the extremes to become more extreme. If all of than is not significantly complicated then the magnetic poles also change (Geomagnetic Reversal) but the periods are not constant. When the three principal variables are added their extremes can create constructive (aggregate) interference and destructive (subtractive) interference. The onsets and recoveries are not constant (over time) either. The chemist Hans Suess, reported, among other things, that the last ice age had come to a surprisingly abrupt end, starting sometime around 15,000 years ago. [Why did the Neolithic begin at the end of the last Ice Age (actually 6,000 years after the last Ice Age) and not after the previous Ice Age]? [Another question : why is there so much coal in the ground? Hint : try extinguishing a fire when the percentage of oxygen in the atmosphere exceeds 1/3 (as it once did). There isn’t a fire service in the world that would be up to it. For Friday construct an argument that refutes our mate at the BOM. Mate Marcus provided a hint in this respect (but I’m not sure that he realises it). It is increasingly puzzling as to why anyone bothers to take notice of this government’s ramblings and irrationalities. Unless the planet is strike by an asteroid in the next 6 months, it will be history and, like the erstwhile unflushable Turd, forgotten except when being excoriated for a worthless bunch of wreckers. All we need do is rely upon the good sense of the electorate. Be absolutely clear on three points. Firstly, the actual trends. Firstly, the actual trends. Dangerous tipping points were passed at climate warming of just 1.0°C – the current level is at least 1.6°C. Kevin Anderson, deputy director of the Tyndall Centre: “There is currently nothing substantive to suggest we are heading for anything other than a 4°C rise in temperature, and possibly as early as the 2060s”. Yet the accepted target – 2°C of warming – is itself the boundary between dangerous and very dangerous climate change. Secondly, our ruling clique is ferociously opposed to recognition of the reality, and especially of the causes, of anthropogenic climate change. Thirdly, our ruling clique is equally ferociously opposed to any action that costs it anything. After all, they’ve had three decades of successful plunder through control of the political class. Why would they not continue as is? We would do well to make those points our climate change forecasts. Was watching Sam Niell’s documentary on James Cook last night – the last episode. This, and the previous episode, was following Cook’s 3rd journey, the goal of which was to find the North-West Passage. The interesting comment is that he was 200 years too early, for while Cook could find no passage through the ice in the northern summer, international shipping regularly uses the North-West passage today. Even cruise liners. Did the documentary mention the (so called) “Mini Ice Age” or “Little Ice Age” from circa 1580 to 1845? All manner of people (of various religious orientation) were blamed for the climatic change to about 1650 – to say nothing of crop failure and deaths. deep breath : There was about 20% more ice above 50N latitude during the Little Ice Age than there was during the Middle Ages. Small wonder that Cook encountered a problem. Had he made an attempt in a Viking ship, at the time of the Vikings, or to about Henry I (of England), he would have got through (and back). Needless to state that the period of the Middle Ages was rather warmer than the period in which Cook undertook the mission. Don’t panic, Jeebus will save us.